If you are the owner of a business, you probably have a pretty good idea of how important it is to hire a commercial pest control company. Whether your business is a restaurant or an office building, there is a chance that you could have a number of cumbersome critters hiding in the shadows. If one of your customers happens to see one of these bugs or rodents lurking around your space, it is very likely that they won’t be coming back anytime soon. And while you may think that a couple of pests are not a big deal, it’s surely only a matter of time before you are dealing with a full-blown infestation. That is unless you decide to rely on the local pest management experts at Earthwise. Continue reading below to uncover all of the benefits that come with hiring a pest control company to take care of your commercial space. Not only are pests unattractive and gross (to say the least), but they can also carry dangerous bacteria and diseases. In certain instances, employees and customers could become so ill from pests that they could eventually sue you for being negligent. One instance in which this could occur is if there are ticks brought into your commercial space, which could lead to an employee or customer getting Lyme disease. Bees and wasps could also potentially sting someone with an allergy which could lead to severe consequences, as serious as death. When you hire a pest control company to manage the pests in your space, you will no longer have to worry for a second about your customers or your employees getting ill from bugs or rodents. It is worth noting that as someone who is untrained in the latest pest control techniques, you are not only far more likely to wrongfully identify the pests, but you will probably misapply insecticides as well. Plain and simple, different types of pests require different types of treatment. When you hire a professional pest control company, you can be sure that they will use their knowledge to correctly identify the pest and then treat the problem quickly and efficiently. When you have certain types of pests in your commercial space like bed bugs, spiders, or mosquitoes, you will be left with itchy and even painful bites. While there are many over-the-counter ointments and medications that can help to soothe these symptoms, wouldn’t you prefer to just prevent these bites in the first place? A pest control company can help you to achieve that and more. You may not be aware that getting rid of pests like ants, beetles, spiders, and other bugs is a multi-part process. Not only do you have to get rid of the initial pests you have identified but then you have to figure out where they are coming from. Pest control technicians know how to determine where pests are entering your space from and how to keep them being able to invest your commercial business again. There are few things worse than having to worry about bugs and rodents infiltrating your business. 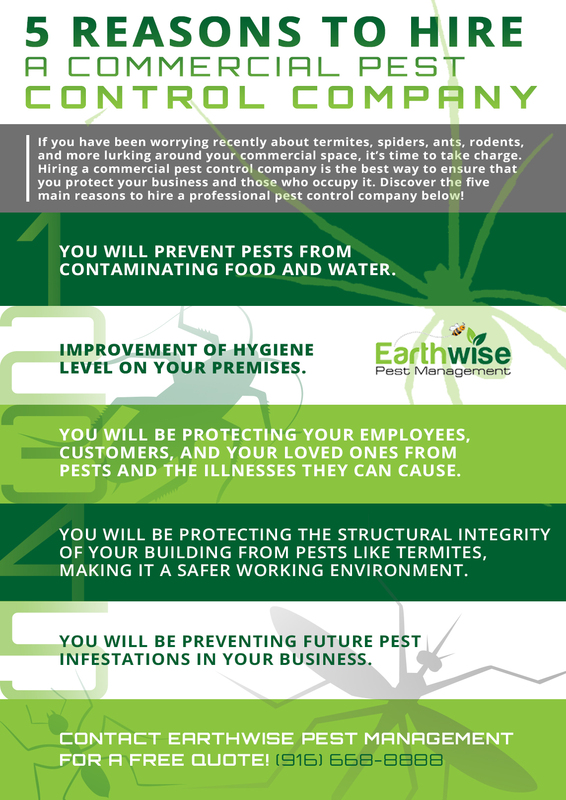 If you want to get rid of pests once and for all, you need to contact the experts at Earthwise Pest Management today. We will make sure your commercial space is eradicated of pests quickly and safely. Contact us today to learn more about our commercial pest control services and what they could mean for your business.